Speaker: Tara Holm is a Professor of Mathematics at Cornell University. Abstract: Topology is often called ``rubber sheet geometry" and is described as ``floppy" while geometry is more ``rigid". Symplectic geometry, the natural geometry of classical mechanics, is floppier than Riemannian geometry but more rigid than topology. I will give an overview of this floppy/rigid spectrum. 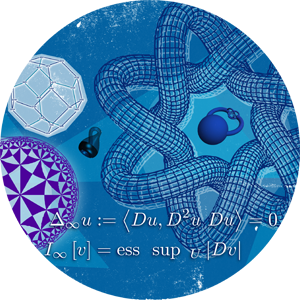 We will then explore how the geometry and topology of symmetries in this context relate to properties of polytopes, motivated by many pictures and examples. I will conclude with how some of my recent work, joint with Daniel Cristofaro-Gardiner, Alessia Mandini and Ana Rita Pires, comes to feature continued factions, counting lattice points, and the Philadelphia subway system.